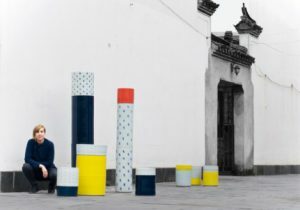 Agnes is a product designer specialized in high quality ceramics. Born in Sweden and educated at The Royal Danish Academy of Design, she now shares her time between studios in Sweden and China. Agnes works mainly in porcelain, which she approaches with a graphic perception. She creates her products in small series that combine hand-made and industrial techniques. Most of her work takes place in ‘the porcelain capital’ Jingdezhen, where she has her workshop. Colour and tactile qualities are essential aspects, and she emphasizes aesthetic and story-telling. Agnes Fries likes to play with archetypes, classic shapes and functions, treating these familiar forms as a universal language for telling stories and inspiring reflection. 2016 production begins at DEN DANSKE KERAMIKFABRIK on the island of Bornholm in Denmark – a new exciting step on this journey! Agnes Fries’s products in our shop. Read more about Agnes Fries at the website.